Sunlight is used to generate electricity with a Photovoltaic solar energy system. It lowers your utility bill, and helps reduce fossil-fuel consumption and global warming. Photovoltaic solar energy systems lasts for many years, and adds to the value of your home. Tax credits and rebates are available in many areas, and many utilities offer net metering. With these, any extra electricity you generate and feed out to the utility grid spins your meter backwards, saving you even more money. Sunlight hitting silicon cells in a module generates a direct current. A switch protects the solar modules from grid power fluctuations. 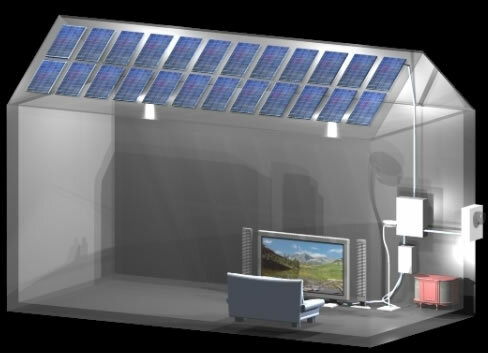 The solar direct current goes from the solar modules to an inverter, which converts it to household AC. If there is extra solar current, the system feeds it to the utility grid, running the meter backwards. If more power is needed, the switch draws power from the utility grid. Solar thermal energy systems capture heat from the sun and use it to heat water. A properly installed system works year- round, even when it is cloudy. Solar thermal lowers your utility bill, and lets you be part of reducing energy consumption, pollution, and global warming. It also adds to the value of your home, solar thermal system looks great and lasts for years. The sun heats a non-toxic, freeze-proof solar fluid in a solar collector on the roof. The controller detects that the solar fluid is hotter than the water in the hot water tank. A pump in the Solar Station pumps solar fluid from the collector to the hot water tank. The solar fluid flows through a pipe coiling inside the hot water tank, and heats the water in the tank. The hot water is available for use in the house. The solar fluid is pumped back up to the collector, where it is once again heated by the sun.